Oh my goodness! This is one exceptionally incredibly good book! I cannot rave about it enough! 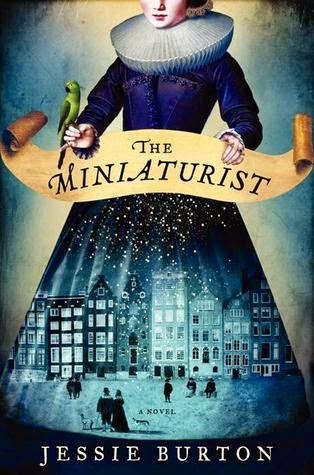 The best way to describe The Miniaturist by Jessie Burton is to call it heartrending novel with a great deal of mystery and a touch of magical fantasy. Rich with emotion and mystifyingly dark, this unique tale gripped me from the start and kept me turning each page, anxious to find out the secret of the miniaturist and the fate of the ever-evolving three-dimensional characters. The novel is set in 17th century Amsterdam and vividly depicts the social and economic living standards of the time. Eighteen year old Nella arrives in the city to the home of Johannes Brandt with whom a marriage has been arranged. But her groom is an enigma, odd in many ways, and distant, even though he is kind to her. Soon after the wedding, she receives a gift of a miniature replica of their home complete with furniture and little people resembling her, Johannes, and his sisters. She begins corresponding with the mysterious miniaturist, but is unable to discern who they are. The miniatures are not what they seem. In fact, they foretell the future. And it is this that adds tension and a great deal of conflict to the story. It is truly disconcerting. Through the miniatures, several dark secrets and tragedies occur, and Nella finds herself in a desperate frenzy to save those she loves. This is a clever, magnificently plotted novel. Although the opening chapters can be a little slow, with every page, the story unfolds and becomes ever more gripping. The dark secrets are revealed bit by bit, in a shocking way, so that one cannot help but race to the end. The story not only stirs up emotion, it shocks and sweeps the reader away with its opulent storyline. A truly magnificent novel, brilliantly written.